Glasgow Defence Campaign: All out for today's demonstration! Mark Thomas lends his support. All out for today's demonstration! Mark Thomas lends his support. 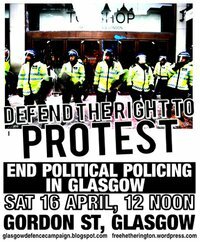 The GDC wishes everyone attending today's demonstration in defence of the right to protest all the best. We urge people to be angry but disciplined and show those intent on destroying our communities and public services that we will not be intimidated, harassed or provoked by Strathclyde police. The GDC today received the following messages of support for the protest. Seize the time! "The current wave in police activity and their attempts to criminalise peaceful protest are profoundly undemocratic and against all principles of human rights. The right to protest is not just a right, it is law. The police should remember it is their duty to uphold the law and protect the right to protest. Good luck to all those involved in peaceful protest against the cuts and corporate tax dodgers. - Mark "
"I applaud your ongoing attempts to highlight the atrocious working practices of Strathclyde Police. Having been a victim of their unethical and immoral procedures to a lesser extent I am aware of the impossibility of any concerns against them being heard or even allowed to be voiced. "Congratulations to those fine young people who are willing to be victimised and intimidated for the greater good. It is comforting to be aware of their and your existence.